Stan Musial baseball cards continue to be very popular among collectors. Widely considered the greatest baseball player ever to wear a St. Louis Cardinals uniform, Stan “The Man” Musial was also one of the greatest and most feared hitters of all time. Although his career spanned 22 seasons, he has relatively fewer baseball cards to collect than say, Willie Mays, who also played 22 seasons. Musial was under contract with Bowman through 1953 so you won’t find him on either of the legendary 1952 or 1953 Topps sets. And from 1954 to 1957, Musial did not appear on Bowman or Topps baseball cards at all stating that he “just didn’t want to sign (a contract) for cards.” according to Topps executive Sy Berger in a 2001 USA Today interview. Nonetheless, Stan Musial baseball cards remain some of the most collectible in the hobby. One of two Stan Musial rookie cards, the 1948 Bowman #36 is considered the more popular of the two. And along with the Yogi Berra rookie, Musial's card is one of the most expensive baseball cards in the entire set and hobby in general. Musial was simply on fire during the 1948 season turning in his highest single season totals for runs scored (135), RBI (131), and home runs (39). His .376 batting average was the second-highest single season total of his Major League career having batted .426 during his first stint with the Cardinals in 1941 (but he only played 12 games before the season ended that year). Had Musial hit two more home runs in 1948, he would have passed Ralph Kiner and Johnny Mize to lead the National League with 41 which would have won him the Triple Crown. Musial's Bowman rookie card shows a young black and white head shot of Musial with a serious and focused look on his face, a stark contrast to most other Musial cards showing off his crooked smile. Musial's other rookie card is the 1948 Leaf #4 issue which shows a nice color action shot of Musial following through on a big cut. While not as popular among collectors as his Bowman rookie card, his Leaf rookie card is the tougher of the two. Odd print lines are usually what keeps the card from achieving top grades. The 1948 Leaf Musial rookie card is among the most expensive cards in the set but pales in comparison to the short-printed Satchel Paige rookie. There is perhaps no better depiction of Musial's famous corkscrew batting stance on any of his mainstream vintage baseball cards than what appears on the 1949 Bowman issue. In Bowman's second year printing baseball cards, a large image of Musial dominates the card with neither his name or team and position information appearing anywhere on the front. Musial would be left out of the 1951 Bowman baseball card set so he would not appear on another mainstream baseball card until 1952. Since Musial was still fully under contract with Bowman, collectors are left to wonder what a 1952 Topps Stan Musial card would have looked like. But they can't complain too much as they were at least treated to a beautiful 1952 Bowman card. A large, bright color artwork from a photograph shows a smiling Musial at the bat. Stan Musial baseball cards did not get much more visually attractive than this one. Bowman issued two separate sets in 1953 with one featuring major stars in color and the other featuring lesser known players in black and white. Musial appeared in the 1953 Bowman Color set which was the first set to feature color photographs of players making it one of the more popular issues of the 1950s. A nice image of Musial in the dugout makes this card clean and straightforward. His contract with Bowman ended in 1953 and Musial wouldn't appear again on a mainstream baseball card until 1958. This card is definitely neither Musial's most expensive nor his most popular. What makes this a key Musial baseball card is that it was the first time he was featured on a Topps baseball card. The story behind it is quite interesting: in that same 2001 USA today interview mentioned earlier, Sy Berger said Topps would donate $1,500 to Cardinal's owner Gussie Busch’s charity of choice if Musial would sign a contract to appear on a 1958 Topps card. The result was the 1958 Topps #476 Stan Musial all-star card in the high-numbered subset of players chosen by Sport magazine. Along with the Mantle all-star card of the same set, it was the only card that was triple printed. 1958 was a big year for Musial as he would join the 3,000 hit club on May 14 that year at the age of 37. Musial first appeared on a regular (non all-star) Topps baseball card in the 1959 set. The card has sharp eye appeal given the blue background and nice encircled action shot of Musial swinging the bat. Musial's name is shown in white, diagonally angled white lettering flows across the top while his position and Cardinals team name would finally appear on the bottom. 1959 saw Musial turn in his worst batting average (.255) of his career and even though many had counted him as finished, he would stick around for four more years to prove them wrong. His 1960 Topps card is Musial's only mainstream baseball card that shows him on a horizontally-shaped card. A nice black and white image of Musial awaiting the pitch straddles the left of the card while a nice color head shot image of him smiling rests on the center-right of the card. Along with team and position info, Musial's name is featured along the bottom of the card in the famous alternating letter coloring of the 1960 Topps baseball card set. 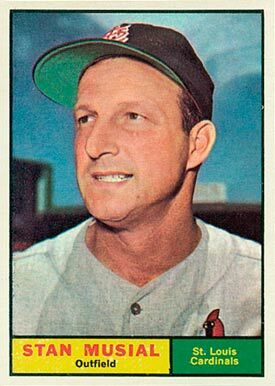 Stan Musial's 1961 Topps baseball card is easier to find in higher grades than his other issues due to far fewer centering and chipping issues relative to other sets of the day. 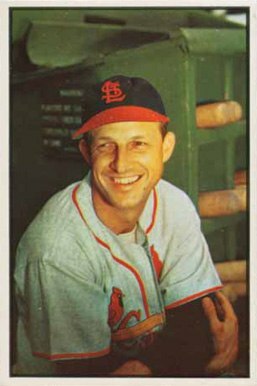 The card shows a nice, large image of Musial smiling and looking off into the distance. Print bubbles will sometimes pop up along the bottom section where his position and Cardinals team name reside. The famous wood-grain borders of the 1962 Topps set are instantly recognizable on this Musial card. Centering can be an issue for collectors as well as chipping given the aforementioned borders. Musial stands ready at the bat with a great big smile on his face on this visually appealing card. Musial had fairly solid bounce-back year in 1962 when he batted .330 with 82 RBI and 19 home runs. 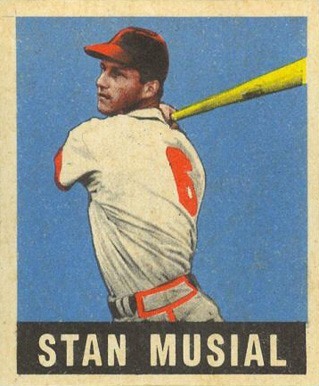 Stan Musial's last mainstream baseball card would be his 1963 Topps issue. His stats for the season were quite close to those that he produced in his uncharacteristically down year in 1959 but this time he wouldn't be back the next season to prove any doubters wrong. Stan Musial finished his career with 3,630 hits and he had exactly the same number of hits at home as he did on the road: 1,815. Along with his 3,630 hits, Musial finished his 22 year career with 1,949 runs scored, 475 home runs, 1,951 RBI and a .331 batting average. Had he not missed the entire 1945 season after enlisting in the Navy during World War II, he would have likely ended his career with over 2,000 runs scored, 500 home runs and 2,000 RBI. He also took home three MVP awards, seven batting titles, and led the Cardinals to three World Series championships. Musial played his last game on September 29 in front of a packed crowd of 27,576 fans. He would finish the game with two hits and interestingly enough those two hits went to the right and to the left of a young Pete Rose. Rose would later go on to surpass Musial in several hitting statistics including his then National League hit record of 3,360 which Musial got to witness. “Stan was there to congratulate me,” Rose said. “I’ll never forget that. He was a great guy. He was in a class by himself. He was one of the greatest players of all time.” Widely considered to be one of the greatest and most consistent hitters in Major League baseball history, Musial was a first-ballot inductee into the Baseball Hall of Fame in 1969, and was also selected to the St. Louis Cardinals Hall of Fame in the inaugural class of 2014.